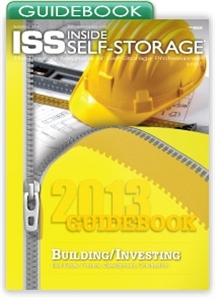 This digital Guidebook is designed for those who want to invest in self-storage or who are serious about establishing or expanding an operation. It covers real estate, finance, development and construction. The process of buying or building a self-storage facility has become more rigorous as markets have become more competitive and changes in the economy impact property value and the cost of labor and materials. Industry construction has become more sophisticated due to heightened consumer expectations and rigid approval processes through municipal planning and zoning boards. To view other guidebooks in the 2013 series, click here.